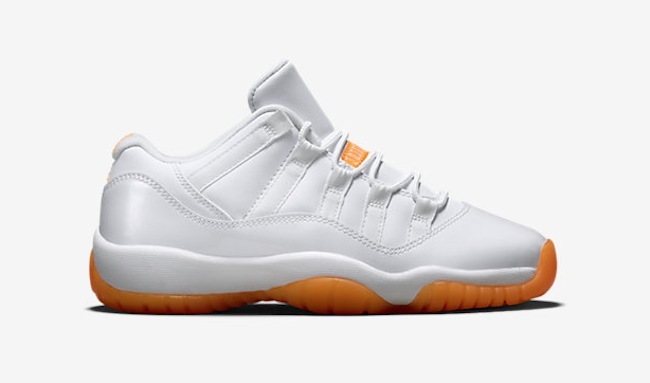 We've Got The Official Look At The Air Jordan 11 Low GS "Citrus"
Official photos of the Air Jordan 11 Low GS "Citrus" are here, and you know what that means. The sneaker is almost here, and we can't wait any longer! This rendition of the Air Jordan 11 Low GS dates back 14 years ago. The classic pair finally makes a return to retailers, and many of us wish we could fit into a pair. Comprised of a beautiful mix of white and citrus, the simple look makes this a great Summer sneaker. Unfortunately the sneaker will only release in GS sizing, so if you can't fit into anything under a 9.5 you're out of luck. Scheduled to release June 20th for $120, let us know if you plan on squeezing into a pair below!